Our multi-channel campaign let Delawareans see the light. Nearly a million participants helped this non-profit shine. Energize Delaware is an initiative of Delaware’s Sustainable Energy Utility. What's that, you ask? That's what we said, when we were first hired to simplify communications about a complex government initiative to save residents energy and money while reducing the impact on our environment. That being said, the success of our campaign can be measured by the hundreds of thousands of participants and the staggering amount of energy, dollars and emissions saved as a result. 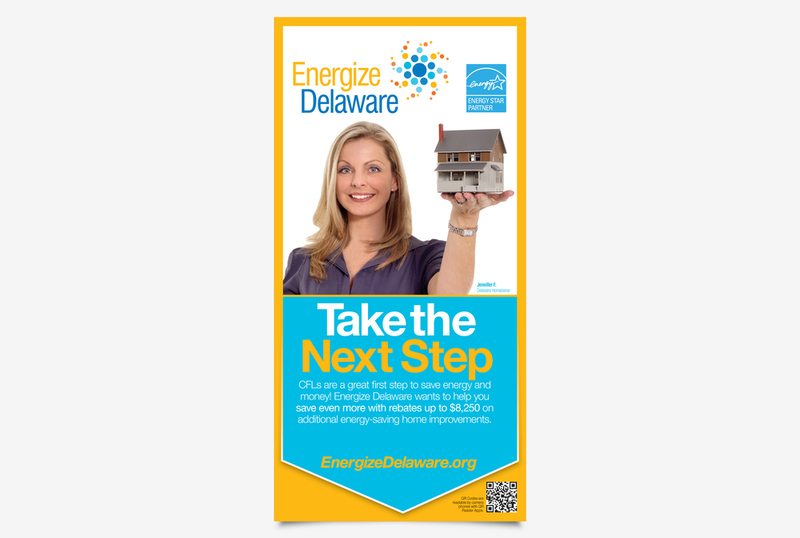 Designed as a major public resource – this UX savvy and mobile friendly site clearly identified Energize Delaware's programs, and directed viewers towards next steps for a cleaner environment and substantial savings. The site worked perfectly from day one. How do you grab the attention of someone driving fifty miles an hour, tell them about a new program that can save them money and energy while reducing their impact on the environment – and not cause an accident? We made it simple! Ever go to one of those giant hardware stores and not have a clue where to begin looking for whatever it is you need? We feel the same way too, that's why we made sure everyone knew exactly where to go and what to do to save big bucks on CFL's right when they walked in. These POS posters appeared statewide at your friendly neighborhood Home Depot®, raking in gigantic exposure and participation. It's all about the numbers... it's always about the numbers. We get it, and we got Energize Delaware big numbers in participation and savings. The details are in the book – a compelling story complete with charts and pictures.